My middle daughter loves soccer. 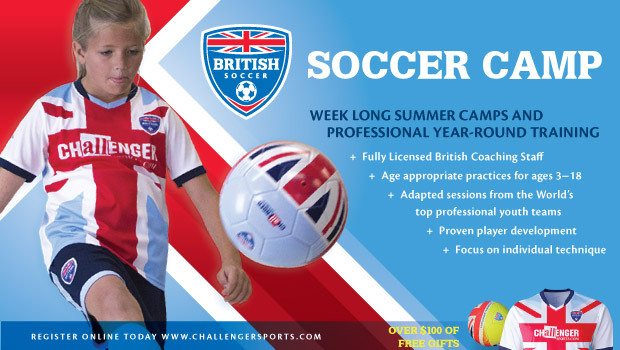 When it came time last summer to find her a camp we learned about British Soccer Camp and after doing some research signed up for the "full day" program for one week. So we were excited to learn that British Soccer Camp is returning to Houston. When I asked her if she would like to return she jumped for joy - and then asked for new cleats. She started to ask for a new ball and jersey too, and dad was happy to hear we don't need to buy those - that they are part of the tuition. So everyone is happy! Each day of the week we started off early in morning dropping my daughter off at a local park to begin her day with soccer camp. On the first day the process for signing in with the camp went surprisingly smoothly. Teams and groups are formed, with boys and girls, based on age. Each day there were special challenges which were both team building as well as confidence building and skills. One thing I thought a little different was that many parents stayed for the entire two hours of the camp, instead of just dropping them off. The camp didn't mind so that's pretty cool that the parents can see what the coaches teach and then can practice those skills at home too. For full day campers you would return in the evening, or you can just sign up for one session in the AM or one in the PM, as your schedule permits. I'm guessing this is done because of the incredibly hot middle of the day which may not be too healthy for the players or the coaches. Coaches were not only professionals in the care of the kids and communication with parents, but they truly are PROFESSIONAL soccer (football) players. I also liked that we had to sign the children in each day and indicate who would be picking them up. We also had to sign them out. My daughter had a wonderful time at camp and not only learned new skills, but continued to master others. She became more confident about her abilities and continues to want to play the sport. Will we go back this year? Absolutely!